ESQUIRE Financing Inc. (EFI) and partner CAPITALIFE Lending Inc. inaugurated their new Makati Business Center on Wednesday, August 09, 2012. This celebration was held in the presence of the CEO of ESQUIRE Financing Inc. Mr Rajan Uttamchandani and business partners. The CAPITALIFE business center is strategically located at #315 Buendia St. in Makati City, only 3 kilometers away from ESQUIRE Financing Inc.’s Philam Life Tower head office which was officially inaugurated in 2011. CAPITALIFE Lending Inc. is expanding their clientele as well as their nationwide reach through ESQUIRE Financing’s business affiliates from their new 2,000sqm business center and continues to service micro loans to salaried individuals to help them get by without having to offer collateral. Through ESQUIRE's intelligent funding, the company has helped over 20,000 micro business owners nationwide to start their dream business. With its strategic location, custom built financing solutions and a team of financial experts; Mr. Rajan Uttamchandani says: “We tailor-fit and customize our services according to our clients’ needs and requirements and we are confident that this new facility proves our commitment to our clientele and the industry as it showcases our service capabilities and financial expertise”. EFI CFO Mr. Sandeep Chandiramani, EFI VP Mr. Ravi Uttamchandani, EFI Chairman Albert Uttamchandani, General Samuel Pagdilao, former DOJ Chief Sate Prosecutor Jovencito Suño, Steve Borsuk of CapitaLife and EFI CEO Mr. Rajan Uttamchandani. 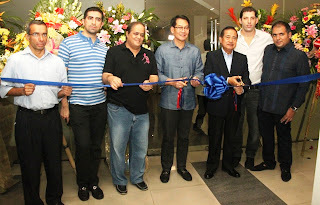 celebration was held in the presence of CEO of Esquire Financing Inc. Mr.